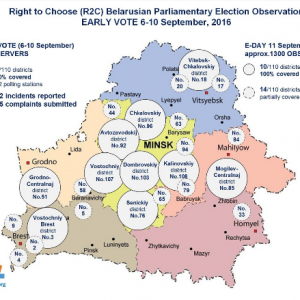 The five-day early voting period of the 2016 Belarusian parliamentary elections took place from September 6 to 10. The main Election Day is Sunday, September 11. Polls are open from 8 AM to 8 PM. In these elections nearly seven million Belarusians are eligible to cast their ballots for one of the 484 parliamentary candidates running for 110 seats. This report on early vote trends was compiled based on information published by governmental bodies, media, and social network users and information received directly from Belarusian parties, and observer groups. Major problems identified by observer groups include increasing turnout though forced and incentivized voting of students and workers, as well as artificially inflating turnout though protocol or voter list manipulations. Parliamentary elections in Belarus can be declared valid if more than 50 percent of eligible district voters cast their ballots. The security of ballot boxes and overall transparency of the early vote were major concerns of observer groups as well. The early vote was primarily monitored by two independent Belarusian election observation initiatives: “Right to Choose-2016” (R2C), a coalition of eight political forces (“Belarusian Christian Democracy”, Belarusian Social-Democratic Party Gramada, BPF party, United Civil Party, “For Freedom”, “Greens”, Party of Freedom and Progress, REP Labor Union), and “Human Rights Defenders for Free Elections” (HRD), an initiative of “Viasna” and “Belarusian Helsinki Committee”. In addition, “Tell the Truth” (TtT) campaign ran early vote observation in some parliamentary districts of their candidates. Incident reports from all of these groups were published on election monitoring crowdsourcing website Electby.org during the early vote. Electby.org in partnership with HRD and R2C launched a mobile application “Vochy” to allow citizens timely and anonymously report violations. Citizens may also report violations directly on the websites of R2C, HRD, or Electby.org. Electby.org also acts as an observer aggregator publishing violations reported by citizens and the above mentioned election groups. R2C deployed 764 observers to monitor 100 percent of 382 polling places in ten parliamentary districts during early vote. These districts will also have full monitoring coverage on the main election day. Monitored districts were selected based on where prominent democratic candidates from R2C member organizations are running (see R2C candidate page to find violations and turnout for a particular candidate’s district). HRD deployed 364 observers at 182 polling stations throughout the country. According to TtT they deployed 180 observers at 90 polling stations in three districts. R2C reported 332 incidents and filed 225 official complaints regarding the Electoral Code violations in five days of early voting. Below is the R2C infographic reflecting the major types of violations recorded by independent campaign observers during the whole five-day early vote period. R2C conducted a parallel turnout count in the ten parliamentary districts where they had 100 percent observer coverage. During a parallel turnout count, observers at each polling station record each person casting a ballot continuously and without intermission. As a result of their parallel turnout count, R2C found that official and observer turnout overlapped only in 69 of 382 observed polling stations, highlighting significant levels of artificial turnout inflation. The turnout discrepancies per fully observed parliamentary districts are noted in the table below. HRD’s 364 observers recorded a 14 percent turnout discrepancy at the 182 polling stations where they observed. Discrepancies at the individual polling station level are best reflected on the Electby.org website, which used R2C data to construct detailed infographics. As shown in the following Electby.org chart of parliamentary district #92 (Avtozavodskoy in Minsk), a number of polling stations inflated turnout, some of them significantly, like polling station #70, where on September 9 the official turnout was 187 voters higher than R2C observed. HRD reported that in electoral district #14 in Bobruisk, an observer challenged 157 votes written in September 8 protocol, because she calculated only 37 voters that day. As a result, the protocol was edited. PEC staff recorded it as a “technical mistake”. The new vote total, however, still did not match the observer’s. A similar incident was reported by R2C at the polling station #32. According to R2C reports, election commission efforts to boost their turnout percentage sometimes are a result of reducing the size of voter lists. At polling station #422 in district #103, observers noted a “voter list manipulation” on September 7, when the total number of voters was decreased without explanation by 879 people. At polling station #71 of district #18 in Vitebsk, the voter list was shortened by 191 people. These cuts resulted in an increase in the turnout percentage. ‘Carousel voting’ was reported as another mechanism used to increase turnout. Yuri Gubarevich, a parliamentary candidate from movement “For Freedom”, a R2C coalition member, informed observers about ‘carousel voting’ in his Kalinovskiy electoral district #108 in Minsk. He claimed a blue minivan brought the same group of people to vote at different polling stations. Observers confirmed ‘carousel voting’ incidents at polling stations #631, #635 and #618. Some observers managed to take pictures of ‘carousel voters’ and confirm the same people voted at polling stations #616, 617, 618, 619, 631, and 632. An HRD observer at polling station #367 claimed to have spotted the same people voting on two different early vote days. She said her video documentation of this was seized by a police officer who took her camera. The CEC Chair Lidia Yermoshina stated there is no forced voting, that school administration’s encouragement to vote early or vote for a particular candidate does not violate the law. However, observers often recorded that school administrations did not limit themselves to just voter encouragement. For instance, at polling station #42, Mogilev State University students had to sign in the dormitory administration’s list to confirm they voted early (the list was captured on video). HRD reported cases of forced voting in Slutsk district #67 and Soligorskiy district #68. An anonymous “Vochy” user reported that “Belaruskaliy” workers had two hours free from work to vote early. RFE/RL reported forced voting of convicts. In this case a policeman left a number of passports with the head of the local commission and returned later to pick them up. Some cases of organized voting were reported on Electby.org, including a photo of military conscripts heading towards the polling station. At polling station #6 in Baranovichi, R2C observers reported than an ineligible 17-year old student of Baranovichi State University was brought by an elder of the student group to vote early on September 7. Another effort to ensure a high turnout was the organization of parental meetings at schools during the early vote period. For instance, in Bobruisk gymnasium #2, where polling station #4 is located, parents were asked to attend meetings on the second and third day of early voting. The parental meeting was attended by a Belarusian Republican Youth Union (BRSM) representative who is also a proxy of a pro-governmental candidate. The proxy promoted her candidate and encouraged parents to vote. R2C observers reported 185 incidents related to unsecured ballot boxes. According to reports, either the ballot boxes were not sealed properly or the room they were stored was not sealed. In some reports observers claimed police officers stayed overnight in the room with the ballot boxes. A notable example of ballot stuffing was reported at polling station #625 of parliamentary district #108 (Kalinovskiy) in Minsk. An R2C observer took a picture of “tightly packed ballots” put inside the transparent ballot box. The existence of a “tight pack of ballots” raised his suspicion because ballots cast one at a time should be loose. R2C observers reported five incidents in which they were not able to properly conduct observation. In 19 cases local commissions refused to provide requested by observers information. On the left you can see a picture taken by an HRD observer titled “the place for observer in Belarus.” The image shows the observer was placed outside of the voting room. R2C reported 23 of their observers were deprived accreditation. For instance, in Minsk, at the polling station #188 of the district #96, members of the election commission refused to accredit observers due to the absence of the commission chair. BCD candidate Olga Kovalkova reported that at polling stations #429 and #430 observers were denied the use of bathrooms. Some independent observers could not begin the observation due to pressure. For instance, R2C reported that the administration of the Gomel State Technical University forbade students from observing elections on behalf of the R2C campaign. According to campaign representatives, students were threatened with the expulsion from the university. In Grodno, R2C observer refrained from election observation claiming his wife was threatened with a job loss by the ideology department in a state hospital. The Ministry of Antimonopoly Regulation and Trade of Belarus sent local authorities instructions how to please voters with food and other treats during the election day. The instructions were leaked to R2C and re-published by independent media. The same day, state media highlighted what food and entertainment will be available to voters at the polls. 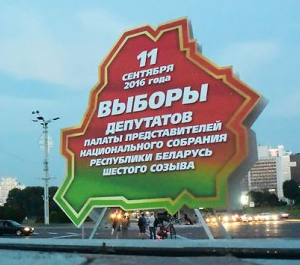 Belarus Digest provided live online coverage of the parliamentary elections in Belarus scheduled for 11 September: the most important developments as well as reactions to the process and results. 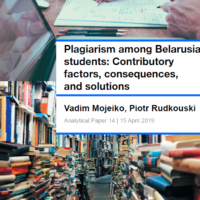 We featured a collection of stories from international and Belarusian media, videos, pictures, and comments from experts. Should you have any questions for our experts or further comments on our coverage please contact our team in Minsk.